Following the weekend on Mackinac Island, we stopped back at the Old Mackinac Point Lighthouse to grab photos for a geocoin that wanted photos at that lighthouse. It was getting colder that morning as the clouds rolled in and the occasional drop of rain fell. 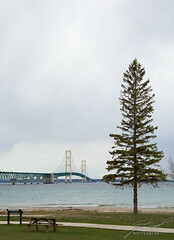 I turned around and popped off this single image though of the bridge with the lone pine tree which just struck me at the time. Had I not been in as much a rush I would have worked the image a little more, likely getting a but lower, and come back with a few more options.